Two weeks ago, I invited the GRC group to join the Makiling Nature Run in UP Los Banos in Dec 13, 2009. We have decided to join this event since some of us missed the Makiling Challenge ’09 in September. The race started a bit late, If I recall it right the 16k runners started 15 minutes late from the planned start time at 6:00 am, followed by the 10k runners and 5 k runners with an interval of 15 minutes. The course was challenging since the route will go up to Jamboree Road, Pook ni Maria Makiling, and National Art Center. On the way back, though you expect all downhill, there was a last uphill climb going to forestry with turnaround after the Infirmary hospital going down to women’s dormitory. I was not supposed to run since I declined 3 days before the event due to my muscle tear in my left calf. I intended to just provide morale support to the group. However, when I got to the site Sunday morning, I felt the urge to join and do a 10km. I was just so stubborn to ignore the pain and didn’t mind what will happen at the end of the race. After the 1st km, I was seriously thinking of stopping and getting out of the race due to the pain on my left calf and shin and that it might aggravate it further. I took a walk break to shake it off on the first uphill climb at Kanluran Road, after a while the pain has become bearable so I decided to continue. The event was not as big in terms of participants as compared to the races at the Fort, but I must say that the organizers has done a good job in carrying out their task during the event. 1. Sufficient water aid stations,. 2. Marshalls were assigned on designated area to guide runners on the right direction. 3. Marshalls on bike were there to monitor runners and provide support as needed. 4. The route was good since runners get to run at Mt Makiling. 16k runners were able to go to National Arts Center. 5. Distribution of singlets were orderly, sorted per sizes. 3. The distance was short of 1km for 10k, and around 1.5km for the 16k runners. 4. Race bib was made of oslo paper/thick bond paper. It easily tear off as it gets wet. At the finish line, the runners need to shout their number as the time recorder manually record the result. The event was good, I think attendance reached around 1,000 runners or less. The weather was good and everybody seem to enjoy their run. 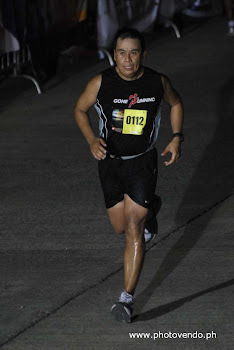 I hope more races are held in UPLB and try different routes. Some Photos during the event. What an inspiration! Nothing is impossible with strong will and determination. This man finished his 10k run. At the last 25m stretch, he hopped until he reaches the finish line. I invited raymund since he was also from Laguna, and he approached us din.. This was his first run with the GRC singlet. See you and thanks for visiting. Im a very active individual. Always busy over a lot of things and just can't stop to engage in things i like. Have been on and off in fitness, hopefully with this blog, it will motivate me more to continue my goal with the inspiration of all runners, bikers, and fitness enthusiast as well.